Wayne was exhausted from his multiple therapy sessions for his cerebral palsy. His family longed for an alternative therapy where he could grow stronger while having fun. Then they found Fieldstone Farm. 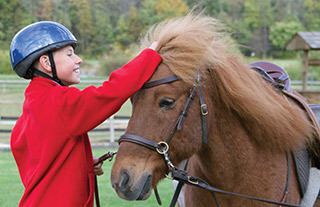 Riding horses has helped Wayne build strength and balance. Our horses have even inspired him to speak. “Whoa” is now part of his vocabulary. And his confidence has soared. He rides around the farm sitting tall with a smile from ear-to-ear. The joy he feels with horses is immeasurable. But horses became even more important to Wayne when his father suddenly died. They intuitively knew his sadness and gave him comfort, support and peace. Wayne is one of thousands who have found a home at Fieldstone Farm.